Natural science is coupled with innovative, quality engineering and encompassed into the aesthetically-pleasing design of the D Series louvres. Airocle’s D Series range of fixed wall louvres offers efficient and reliable natural ventilation solutions across a variety of applications – maximum airflow is guaranteed. One of the key features of the D Series range is the use of larger blades than our standard fixed wall louvres offering a 60% free open area. With rigorous testing, superior construction and more than 30 years in the natural ventilation business, you can trust market-leader Airocle to produce louvre ventilation solutions to suit every need. Airocle’s D Series of fixed wall louvres are particularly suitable for installation over large banks of louvre area. D Series louvres have a proven track record of optimal performance in commercial, industrial and community projects. Airocle’s innovative design principles make D Series an easy way to improve building amenity, including airflow and occupant comfortability. With more stringent building regulations in force, it’s become mandatory to create environmentally sustainable structures. D Series louvres combine modern technology with natural science to produce ventilation solutions that meet all relevant building standards, promoting a sustainable future. Airocle’s D Series is specifically engineered to endure all types of weather. Louvres are storm-proof and weather-tight. Airocle’s innovative design principles using natural forces combined with superior construction methods mean D Series louvres help conserve energy and lower associated costs. Airocle’s D Series offer a ventilation solution that’s both simple and user-friendly when it comes to installation. All units are shipped completely packed-down with the necessary parts included. Louvres can be easily installed by qualified tradesmen. Made of the highest quality materials, Newport louvres are customisable in size to a maximum blade span of 2000mm – 400mm more than our C Series of wall louvres. 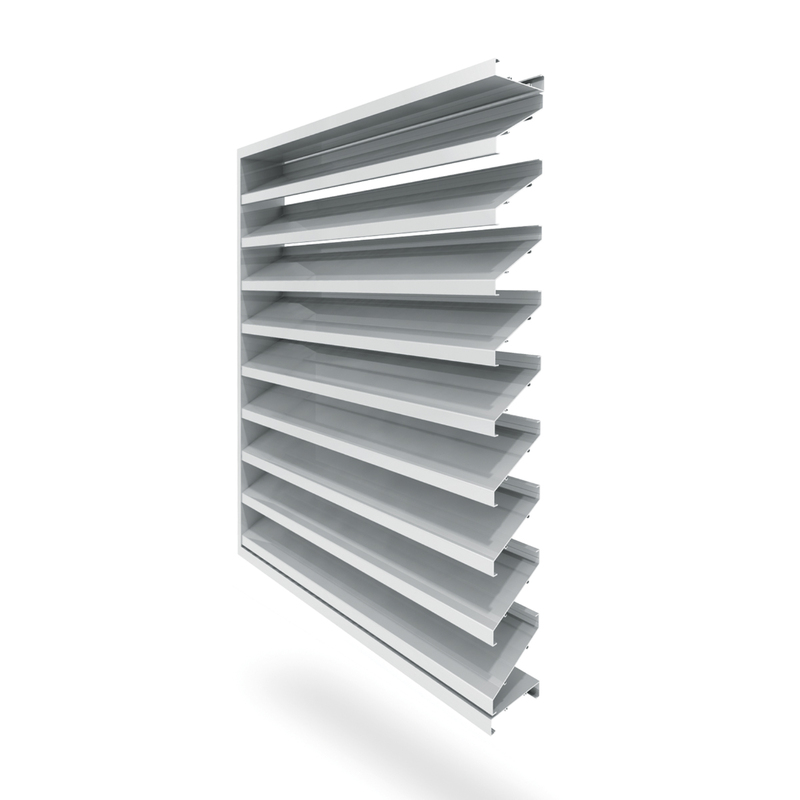 D Series fixed louvres come with optional bird, vermin and insect mesh, available in a range of materials. Rain sensors, security screens, security bars, blanking sheets, volume control, fire & smoke dampers and dust filters are all available as extra accessories, maximising the efficiency of the overall system, where required. Our dedicated team of ventilation experts are here to assist you find the absolute best natural ventilation to suit both your building or project and surrounding environment. Contact us for more information on how we can help you achieve optimal results fulfilling all your natural ventilation needs. Once installed, you will find D Series wall louvres to be sustainable, hard-wearing and best of all, subject to virtually no running or maintenance costs. At the cutting edge of innovation when it comes to the worldwide natural ventilation industry, all Airocle products are designed to be economical to install and run. NB. Full Test Results are available from Airocle. Contact us for all your natural ventilation needs.